Welcome to the Durrington Town Council website, we do hope you enjoy using the site and find all of the information you require. We are always working to improve the site and keep it and you as up to date as possible. The Parish of Durrington, which incorporates Larkhill is in the Amesbury Community Area in Wiltshire. There is a population of just over 7,000, comprising approximately 2500 households, this includes just over 550 services families’ accommodation at the military Garrison in Larkhill. 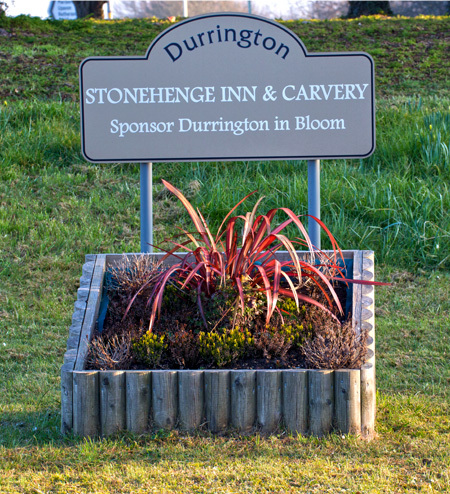 Durrington lies on the edge of the World Heritage Site of Stonehenge, and covers an area of over 2700 acres. The parish is known for its Neolithic features, Durrington Walls and Woodhenge, both dating back to 2,400BC. Sitting on the Avon Valley, with the River Avon running through its boundary, Durrington nestles a mile away from the A303, with the A345 connecting it to Amesbury. The nearest mainline railway station for London and the South West is 5 miles away, with London just a 1 hour 20 minute journey by train. There is also a frequent local bus service to Salisbury and Swindon. The Parish has an assortment of facilities, including three mini supermarkets, a number of takeaways, hairdressers/barbers and doctors’ surgeries, a DIY store, a local garage, a carpet shop, library, post point, two public houses and four churches. There are three primary schools, a secondary school and a number of nurseries and pre-schools, as well as a swimming pool, sports centre and tennis courts. There are a number of play parks, a skate park, BMX track and Multi-use Games Areas, as well as a village hall, recreation ground and pavilion, where frequent activities take place to support the community throughout the year.